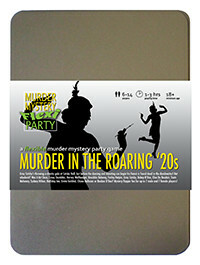 You've been invited to play the role of KNUCKLES BALONEY in Murder in the Roaring '20s. Gray Catsby has invited his most talented and wealthy friends to a charity gala event at his countryside residence, Catsby Hall. But before any dancing and donations begin, Catsby’s fiancée, Ginger Whiskers, is found dead in the dumbwaiter! Join the flappers and dappers to find out who finished her off! You like wearing a pinstripe suit and trilby hat (with a white ribbon, obviously) along with polished, two-tone black and white shoes. You’ve also inked ‘LOVE’ and ‘HATE’ on your respective knuckles. As a kid, you were constantly chewed out by your parents for having no skills. Then, when you landed a job as an apprentice butcher, they were over the moon. But they didn’t count on that slaughterhouse being run by Bugsy LaBone - a big time crook and restaurant owner. It wasn’t long before you were dicing some choice fresh cuts for Bugsy and moving your way up into the wise guys, running clubs of your own. I’m Knuckles Baloney, but you can call me Mr Baloney. I’m sorry to have witnessed this tragic sequence of events. My car broke down nearby and Mr Catsby was kind enough to extend an invitation to dinner, even though I’ve yet to step in the dining room. I owe him a big favour, so to repay his generosity I’m going to get to the bottom of the Ginger killer case for him. I hope you all got alibis.